The King's Somborne Village Hall is available for hire for activities such as stage productions, exhibitions, dances, wedding receptions, parties and recreation uses. The hall is managed by the King's Somborne Management Committee and is administered by a team of volunteers who look after such things as cleaning, maintenance etc. The hall is very conveniently situated fairly equidistant from each of Andover, Romsey and Winchester. The hall comprises a main hall with a capacity for up to 200 people. A fully equipped kitchen includes a cooker, refrigerator, microwave, commercial dishwasher and cutlery and crockery cupboard holding 120 place settings. Toilet facilities include facilities for the disabled. The main hall also incorporates a well equipped stage area. Sound and lighting facilities are also available. The Jubilee Room is a light, airy room that may be hired out separately for smaller events that do not require the full size of the Main Hall. It may also be booked in conjunction with the Main Hall as a Reception Room and/or Bar when holding a big function. The new committee room is an excellent facility for small meetings. It may be used for venue for small group meetings, with seating for tup to 16 people in comfort. The pavilion area including changing rooms is also supervised by the Village Hall Management Committee. 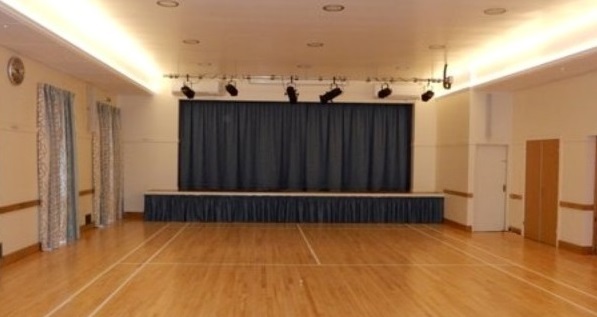 This part of the hall is available for sport functions on the recreation ground. It includes a kitchenette with servery access to the field outside. The Hall has its own alcohol licence. If you intend to sell alcohol at your function, or provide alcohol as an inducement (ie as part of the entrance price), the sale must be previously approved by the Management Committee. Please see details on the Bookings page.